I've wanted to post about this gel several times but have always had second thoughts because, as we all know, Sephora aren't on the Emerald Isle (Boo Hiss). The more I think about it though and the more people ask me for Sephora recommendations as they jet off (the lucky suckers) the more I think it's something I should let you all know about. This 15ml tube of Anti-Blemish Gel has been saving my skin, literally, for the past 5 years. I first picked it up on a trip to Paris as I had a ridiculously painful, cystic intruder on my jawline, feckin' hormones! I remember using it before going to bed that night and realising that it didn't hurt so much in the morning. I also remember it being completely cleared following the second day and getting my tuckus back to Sephora before our flight home to stock up. It costs between €2 and €3, depending on the Sephora you frequent, I think it was actually 2 for €3 in Amsterdam but I honestly wouldn't be without it now. Not only does the clear gel absorb quickly but it leaves no residue on the skin, so it has Sudocrem beat there, hands down. My most favourite thing about Stop the Spot though? Since using this little beauty I haven't once had a hormonal jawline breakout, as soon as I feel that tell tale pain in my face I slather some of this gel on, come the second day the pain is gone and disaster has been averted. Almost worth the price of a flight alone. Not only is it great at prevention but on existing breakouts it works to dry up the affected area and speeds up healing time , which reduces redness, chances of infection and, of course, mortification. I wouldn't be without it now and if you find yourself on your holliers and wandering the halls of Sephora, be sure to throw a couple of these bad boys into your basket. You won't regret it. please tell me where is the nearest Sephora to us????? i want, no i NEED this stuff, sounds deadly, is there one in London???? think my mum is going to Italy next month, is there one there??? Bad news. 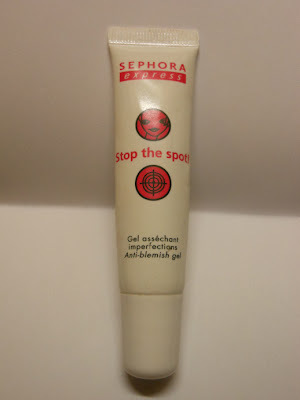 As far as I know, sephora doesn't make this product anymore. I asked for it in many Sephoras in France and in Spain and the sellers told me they are not going to received it by the moment. I bought a similar product made by Benefit called Boo boo Zap! but it's no so good.